If you live in the Central New Hampshire area, chances are more than likely that you’ve heard of singer/songwriter “Jim Tyrrell”. He and I go back just about a decade, back when music was a huge part of my life. We met at an open mic at my favorite home town bar called “The Lucky Dog Tavern and Grill” and we found that he lived just up the road! Anyway, making a long story short, during that time I had quite a bit of equipment to complement my shows, but mostly guitar FX pedals. To help manage them and to give me a quick and easy set-up each time I played out I constructed a powered pedal board with many nice features, including a custom carrying case I had made up. This was very nice because I had two separate guitar set ups. One for my acoustic and one for my electric. Jim is now a full time musician, playing over 100 shows a year now and making a pretty good go of it. However, in this he’s finding that his gear is taking quite the beating. This brought to his mind an old memory of the pedal box I made and he asked me if I’d be able to build him one. His set-up is much simpler though which made this a quick build to this point, using only three pedals which are independently powered by separate AC plugs. Though I’m going to assume that the current probably get’s changed to DC inside the pedal, without breaking into them I wasn’t going to be able to power the in an effective manner. No worries though as like I said, he only has three pedals, two of which need to be powered. But because this was quick, I decided to put my router to use and made a built-in Advert for him. 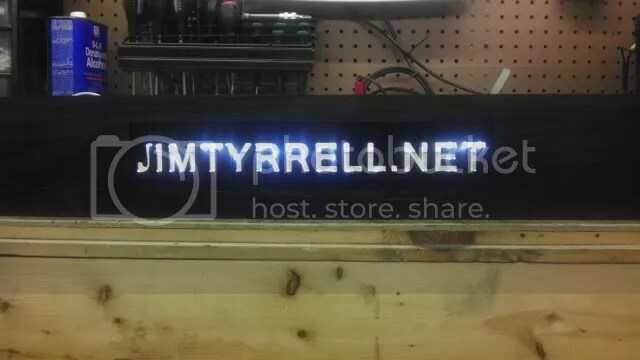 By cutting out his website’s address into the front of the board and back-lighting it with some extremely bright LED’s, it’s sure to grab a bit more attention! More pics and a build log can be found over at the Made-By-Bacteria forums where I will continue to update as I go. 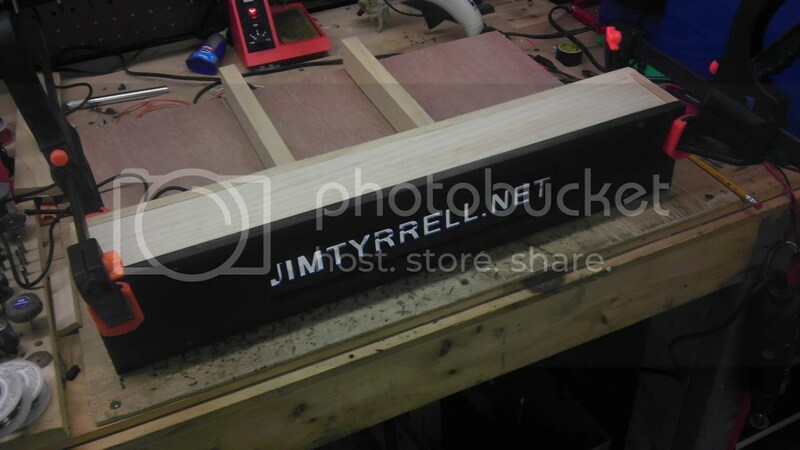 Hopefully this helps Jim make people a bit more aware of his site as it will now certainly stand out on stage! CND Custom Gaming.com Beta is live! My You Tube channel hits 100 Subscribers!